Some people consider it madness to ride a bicycle in a city and its major roads and highways. In Bangkok, for example, where cycling is encouraged by the government and bicyclers form a considerable part of the road motorists, it is considered dangerous and even downright suicidal by many. So, whether you believe it is not safe to ride a bicycle or you’re one of the courageous few who believe that it all depends on your confidence level, you’d be pleased to know that cycling in the streets of Hua Hin and Cha-Am is generally safe. Hua Hin and Cha-Am are definitely small by comparison to Bangkok, the capital city of the country. As such, the roads in these towns are quieter with few motorists about by large city standards. The major roads are never too busy to make bicycling dangerous. Still, if you want to go on the safe side, you can always avoid the busy streets and use side streets instead. In Hua Hin and Cha-Am, that is easy to do. There are several cycling companies offering cycling tours that do not use the main roads. In Cha-Am, there are also numerous shops offering bicycles for rent. Getting around by bicycles is also popular in Hua Hin. 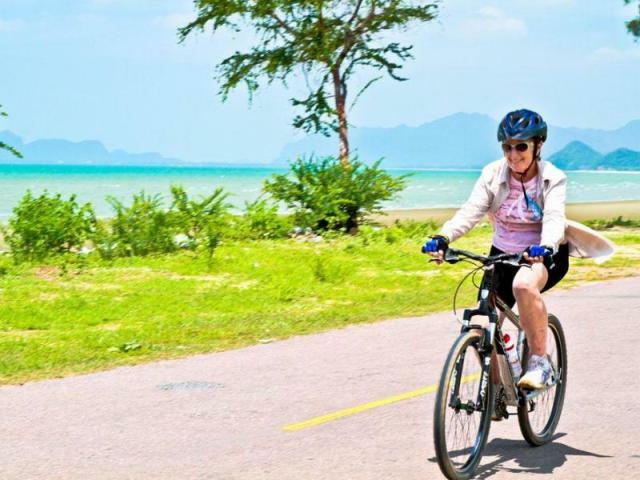 When you’re in the area, you should also try riding a bicycle because cycling in Hua Hin/Cha-Am is like cycling in major cities, less the constant fear for your life. It’s all about fun and comradeship. In fact, if you’re traveling alone, some cycling tour companies even have cycling buddies available. Some cottages in and around the beach also have bicycles for rent. There are mountain bikes for those who are serious about biking. And there are many biking trails even in the mountains. The tours generally include pick-up from your hotel and delivery to your hotel after. The bicycles that you will use and bicycling gear like helmets and pads are also included. If you’re availing of a whole day tour, lunch and snacks are also often provided. If you decide to try cycling in Hua Hin/Cha-Am, remember though that this is still Thailand. And in Thailand, drivers are taught to drive instinctively. When a lane opens up, they go fill it. Whether or not another driver is trying to get in. Some also drive like crazy although there are by far fewer of those in Hua Hin and Cha-Am than in bigger cities. But if it isn’t the drivers, it’s going to be the dogs. Avoid bringing valuables and stay close to your group. So, you’re going to Hua Hin and Cha-Am? It’s time to try cycling in Hua Hin/Cha-Am. You might never get a good chance to tour by bicycles again, at least not in a quieter and peaceful environment.